The 10 Best First Date Locations in Utah! First dates can be a little awkward as you prepare to make a good first impression. But setting the tone with the right atmosphere can really help to alleviate that feeling. Cultural activities and interesting spaces provide the foundation for an exciting and scenic dating experience, and Utah is home to plenty of that. And who knows, the Beehive State could prove to be the home of your very last, first date! Rock climbing isn’t for everyone, but for the adventurous first-daters out there, the Quarry Indoor Climbing Center is one of Provo’s most popular spots for casual dates. If you have a membership, you can bring a friend for free on Fridays (in addition to one free buddy pass a month that you can use on any day of the week). On Saturdays, the indoor climbing center has “date night,” meaning that two people can rock climb for the price of one. Wheeler Historic Farm is a free public park and farm operated by Salt Lake Country Parks & Recreation. Open seven days a week, you and your date can watch (but not pet) baby farm animals not far from downtown Salt Lake City. Depending on the time of the year, you can even enjoy some of the farm’s produce. Lagoon is Utah’s only amusement park. It is a popular spot for all things fun and frightening. If your date likes insane rollercoasters, cotton candy, and cute carnival games, this is a good place for some good discussion time on a creaking (but safe!) Ferris wheel. 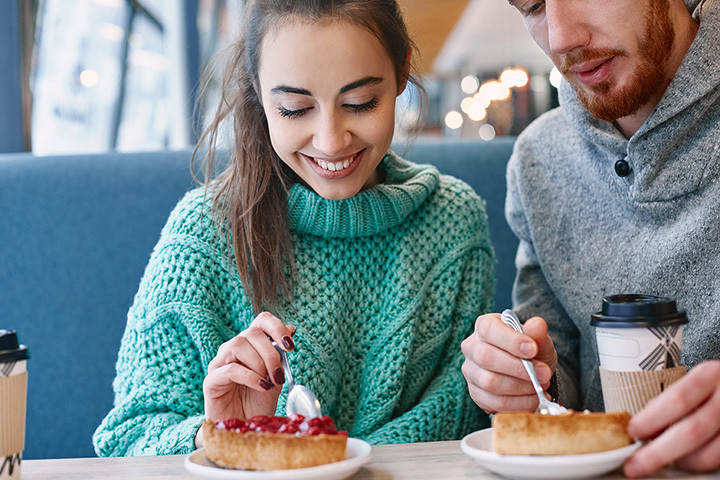 Going out to dinner can feel too expensive for a first date, and if you really only want something sweet, the Chocolate Dessert Café in Orem and West Jordan is a quaint spot where you can enjoy pretty much any dessert imaginable. Their most famous menu item is the shareable “Cazookie,” a large cookie baked in a pie tin that is then topped with a big scoop of vanilla ice cream. It’s not often that adults get to play games while eating at a restaurant. But at Good Move Café in Provo, that’s the business model. Order a meal or some snacks and prepare to play. The restaurant has over 700 different games to choose from, and if you get bored of one, you can move on to another. If you can’t make it to France, let France come to you. That’s kind of what it feels like to eat at the Paris Bistro in Salt Lake City. If you’re worried about the first date being too romantic, don’t fret. This place is warm and charming without feeling too intimate. It could be the perfect place for you and your date to discuss a mutual love for travel, and to experience a mutual love for creme brulee. You wouldn’t typically think of making soap on your first date, but the Soap Factory in downtown Provo wants you to do exactly that. Of course, you don’t have to go to the Soap Factory on a date, but if you do, it’s likely you and your date will have a lot of fun. For an entry fee and the cost of your supplies, employees will show you how to make your own soap, lotion, body scrub, lip balm, or pomade. There isn’t much that is more nostalgic than a nickel arcade, and even though it will take you a bit more money to get into Nickel City, all arcade games do only cost a nickel. For a few hours, you and your date will be transplanted back to better days, playing Pacman, Skeeball, and a bunch of other classic (and upcoming) arcade games. With sweet crepes priced at $5.99 and savory crepes priced at $7.99, the Roll Up Crepe is a low-key hangout spot with all the right vibes to make your first date not awkward. So, don’t be fooled by their hilariously named menu item “Awkward First Date” (a sweet crepe with caramelized bananas, vanilla ice cream, and caramel), you’ll have a relaxed time here, and if you come on the right night, you’ll even be able to enjoy some live music. One of the world’s most famous film festivals takes place in Park City every year, and if you have the chance to take a date to one of the festival’s screenings, you’d officially be the best date organizer ever. Started by Robert Redford over 30 years ago, the festival premiers hugely successful independent films and attracts celebrities from across the globe.